This Waves we are breaking the conventions of the ‘convenient’ good and embracing the shadows beneath. We invite you to revel in the mysteries of life, to join us on a thrilling ride. Pack that suede biker jacket and that black metallic dress because on 26th October, Waves is going badass. Earth to earth, ashes to ashes, dust to dust. The mightiest find ruin, the most glamorous face gloom, but the underdog in the shadows, finds the chance to bloom. This year, Waves returns with reinforced vigor, with the stage set for the country’s most famous artists. As we prepare for over 40 events spread across 9 panels, get ready to witness some of the most awe-inspiring moments this year! This Waves, get ready to feel the goosebumps and experience the sheer euphoria that awaits you when you join us to Embrace the Shadows! 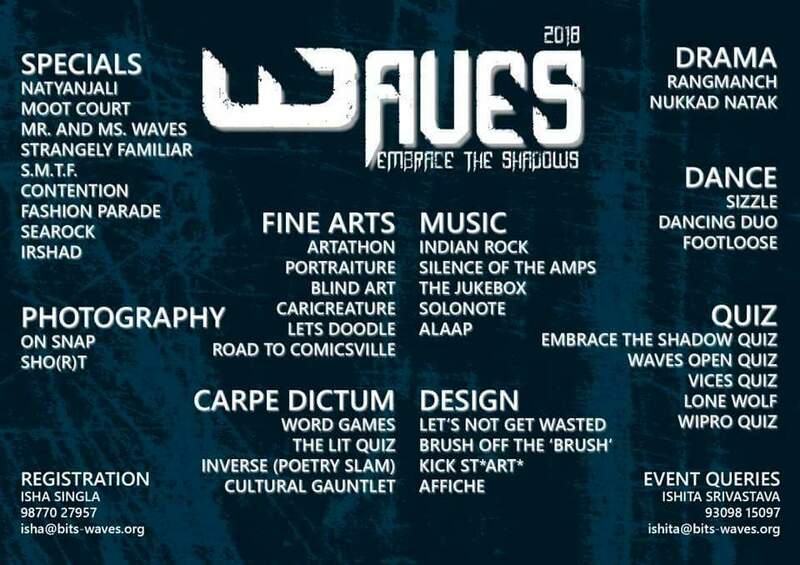 Presenting, the Events for Waves 2018! This year, Waves returns with reinforced vigor, with the stage set for the country’s most famous artists. They prepare for over 40 events spread across 9 panels, get ready to witness some of the most awe-inspiring moments this year! For any other queries email us at info@bits-waves.org. Noticebard is proud to be the media partner for this event.